In AT&S, you can set or change the point value of questions for a specific assessment. You have the option to publish assessments that are worth points or have no point value. By default, the setting is checked. You may assign homework for practice but it will not count for a grade. In this case, you want to uncheck the box. 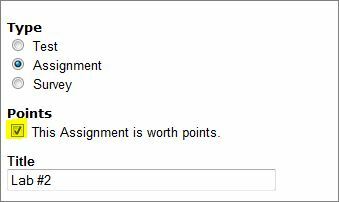 If the “is worth points” box is checked, but you forget to assign points to your assessment, AT&S will alert you. 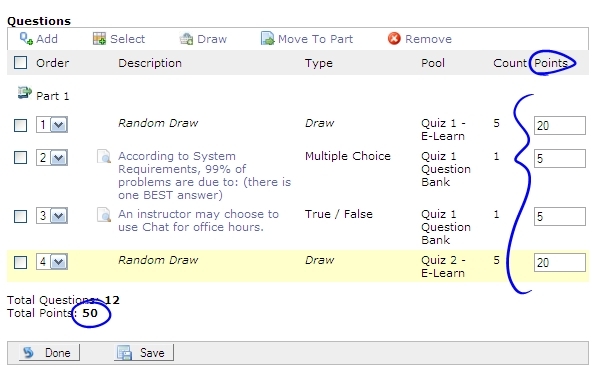 Note that the fields in the “Points” column for questions OR draws are editable. If you have authored questions in pools and you have assigned point values to them in your pools, when you select these questions in your assessments, the point values from your pools are assigned to the questions by default. However, you can override the question point values for a specific assessment at any time (even if the assessment is published and students have started taking it). The system will auto-adjust the scores. Any changes to point values you make in the questions of a specific assessment affect the assessment only, and not any other assessments were the questions are used nor the point value of the pools. Change them in all locations, if desired. Questions may have different point values in the various assessments where they are used. If you override point values in questions or draws and change your mind and delete the points from the fields, the default points from the pools will auto-populate the points field of the questions or draws.